BYOD (Bring Your Own Device) is all the rage it’s in just about every industry, all across the US. Whether your organization is already allowing it or not, chances are you already have employees bringing their own devices and using them at work anyways. According to the US and European Enterprise Decision Maker Survey, over 80% of companies report that employees use personal devices for business use. The infographic below displays the many trends and challenges associated with BYOD security risks. The fact of the matter is BYOD is inevitable with or without the organizations approval so the smartest thing to do is just prepare for it. 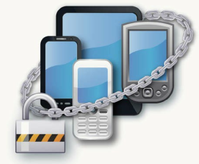 Security is the big challenge and one of the main reasons organizations have never allowed BYOD previously. In the past if you did allow someone onto your network with their personal device, you didn’t have an effective way to limit what they did on your network. There is just too much at stake when this is the case. To better prepare for BYOD securely this is my advice- your system needs to be built on what we call “Role Based Access Control”. This allows you to know who, what, when, and how people are connecting to your network and limit their access based on that profile or role you have set up. This is where we can help. We have helped hundreds of organizations get prepared for BYOD safely. If you have any questions about how to implement a secure BYOD program, or you would like a free BYOD readiness consultation, you may contact us here. Good luck!